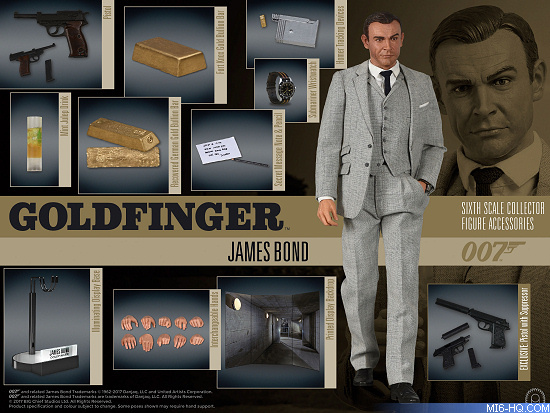 The first 007 licenced sixth scale figures from Big Chief Studios will be available to pre-order on Friday 10th February from 5pm GMT. 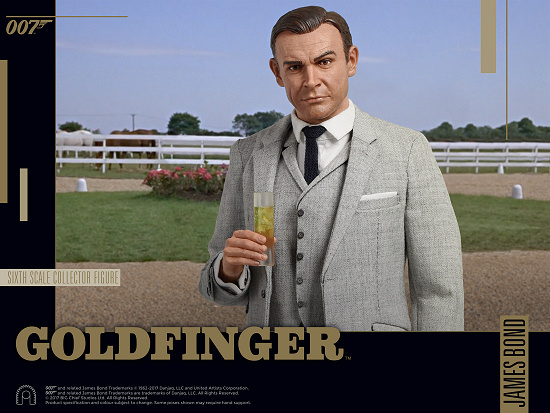 Developed in collaboration with EON Productions the first three figures in the James Bond range are taken from the 1964 classic 'Goldfinger' and include James Bond as portrayed by Sean Connery, Auric Goldfinger as portrayed by Gert Frobe and Oddjob as portrayed by Harold Sakata. Each figure features a faithfully realised character likenesses, beautifully detailed hand-tailored costume, accurate miniaturised accessories and a light-up display base. Our artists have spent months pouring over reference material and still photographs to ensure that these figures are the very best representation produced. The First Edition Sixth Scale Figures are limited to the first 700 pieces of each character and offer collectors the opportunity to obtain the lowest numbered figures. In addition to the lower numbers the First Edition figures come with additional accessories, which are exclusive and not available separately, or in the standard Limited addition. As an added bonus the First Edition figures also come with a special slipcase which features gold foil gun barrel motif, First Edition branding and the unique number on the back. The First Edition figures are exclusively available direct from BIG Chief Studios. The additional accessories will not be made available separately at a later date. The Limited Edition Sixth Scale Figures come with all of the standard accessories and packaging and are numbered from 701 onwards. The final overall edition size will be confirmed at a later date. Investigating suspected gold smuggler Auric Goldfinger, Bond uncovers Goldfinger's plans to contaminate the United States Bullion Depository at Fort Knox. 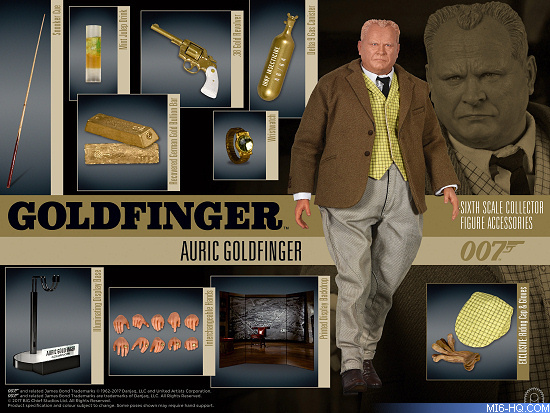 A wealthy and successful businessman, owning many properties throughout the world, Auric Goldfinger is an international gold smuggler. A psychopathic man obsessed with gold, his business affairs come under suspicion from the Bank of England and James Bond is sent to investigate. 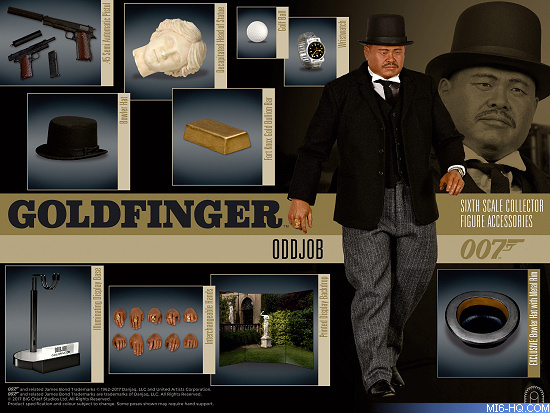 Oddjob is Goldfinger's fanatically loyal personal chauffeur, bodyguard and golf caddy. Physically he is extremely strong and carries himself with a stoic demeanor. Oddjob's infamous hat has a metal rim, which he uses as a lethal weapon. Pre-Orders can be made from 5pm on the Big Chief Studios website. The figures are expected to ship in Sep/Oct 2017.